This past week the Cold Spring Chamber Business After Hours was hosted by Creative Engravings of Cold Spring. 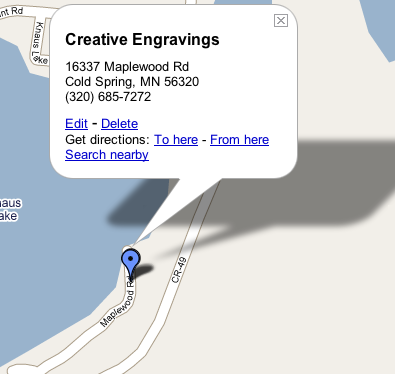 Pat Decker and Sharon Rueter, owners of Creative Engravings, invited the Chamber out to their home office just south of Cold Spring on the Chain of Lakes. In this story, Sharon Rueter tells about the different kinds of awards, metals and custom keepsakes their company designs and manufactures. See first hand "The Incredible Machine" that does all of the special engraving letters and graphics. This story is sponsored by Creative Engravings, your local source for quality engraving to meet both personal and business needs. Pat and Sharon will work with you to create custom awards, signage, trophies, gifts and much more. Give them a call at 320.685.7272.